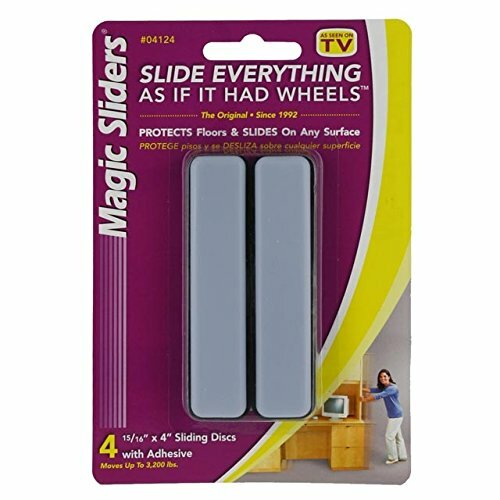 A rectangle shape makes these handy furniture glides great for moving straight-edged furniture without legs, like armoires, desks, filing cabinets, bookcases and entertainment centers. A high tech polymer construction works to reduce friction so items can slide with ease, without damaging the floors or the furniture. Installation is easy; furniture gliders use double-sided adhesive tape (included). Use for moving an item, or apply and keep under a piece of furniture you move frequently for cleaning. One package contains 4 self-adhesive 4" x 15/16" furniture pads and moves up to 3200 lbs. Weight capacity : 3200 lbs.